Our whistle stop tour of Skye lasted three nights and on Sunday morning we were back on the road heading towards the Skye Bridge and the far North West. 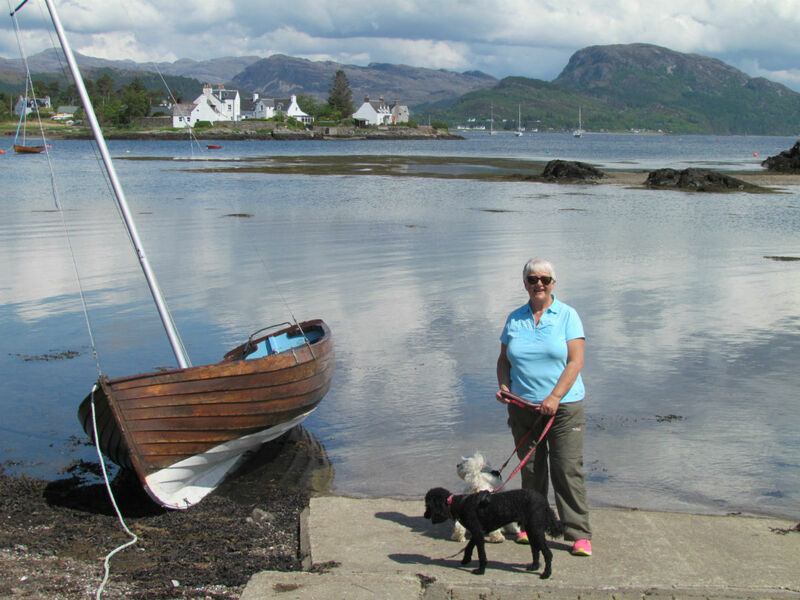 Having paid attention to a few other motorhomers’ tales we took a detour to Plockton, known as the Jewel of the Highlands, or at least that’s what it calls itself. Plockton was full. There was not a parking space to be had anywhere and the place was heaving with visitors. This should have been no surprise at it was a Bank Holiday weekend and the sun was beating down. The business owners of Plockton must have been delighted but we were less so. It’s a several mile drive on single track, twisting, undulating and badly tarred road to get there and we thought we were going to have to drive right back to Kyle of Lochalsh without stopping. Fortunately, after manoeuvring our 7.4 metres and nearly 4 tons round in the small available space at the bottom of the hill we drove back up and found a parking space in a viewpoint at the top of the hill. Out we jumped and trotted down the hill again with only one thing in mind. Well, there was only one thing in my mind – ice cream! Some of you might have noticed a theme here. Shirley, the tour photographer, was focussed on getting some pictures as well. Plockton is undeniably pretty. It is in a sheltered bay and is surrounded by magnificent scenery, boats in the harbour and pubs and restaurants aplenty, yet I was a little underwhelmed. It is as pretty as many other little seaside places I have been to but to call it the Jewel of the Highlands is, at least to my mind, overstating its appeal. The Highlands are so magnificently wild and varied with literally thousands of beautiful places to explore that choosing one small corner and giving it such a grand title seems a bit pretentious. Also, we could only get ice cream in the chip shop and it was the whippy type that is full of unspeakable additives. Did this put us off? No it did not and we slurped our way through 99 cones in the sun and could have believed we were in Cornwall. Where did this fabulous sunshine come from? It’s a miracle! Photos on memory card and ice cream in stomachs we wandered back up the hill behind a small family. The smallest child, a little boy of around five, kept calling “Mama, Mama, Mama!” in a loud plaintive wail as he trailed after his mother. I was on the verge of pleading with her to answer him when she finally asked in a weary tone what he wanted. “When can we go home?” he wailed and I thought ungracious thoughts as we put on a spurt of speed to overtake them. We weren’t to be released from the wailing though – as we took off up the hill we could still hear him, “Mama, Mama, Mama!” There are days when I fully understand why we have the menopause. Back along the winding, single track, tarmac forgotten road we went, pulling in every few minutes to let more adventurous drivers past until we hit the main A road that would take us to Gairloch. To our surprise, nay horror, even the A road becomes single track in places and we began that strange dance of pulling into passing places every few minutes again. It’s tiring, this Highland driving as well as awe inspiring. The mountains and glens are incredible, ranging from sparkling beauty to dark forbidding presence, depending only on whether or not the sun is shining. We drove through every season on that road yet as we rolled into the outskirts of Gairloch the sun was beating down – it had been sunny all day there. The weather patterns in Scotland are very localised so our advice is, if you don’t like the weather where you are, drive on a bit. Very quickly we found a free place to stay the night at the top of the hill, overlooking the big beach and we settled down for a quiet evening beside three other motorhomes. Never a truer word and all that. Soon we were off again, heading in the direction of Poolewe, specifically Inverewe Gardens. We’re National Trust members in a similar way to some gym members. We pay our dues each month but rarely turn up. Today was the day – we could park and go into the gardens using our cards and feel like we’d got something for nothing. I realise this isn’t rational – see the poem above. The gardens are extraordinary. Partly due to the warming effect of the gulf stream and partly due to the ingenuity of Osgood Mackenzie in the 19th century, the place is alive with thousands of exotic and interesting species of plants, trees and flowers. Shirley went mad with the camera – thank goodness for digital technology. I was amazed by the loud buzzing of bees all round us and then, making our way to the jetty, we were blown away by the sight of a heron’s nest high in a Scots Pine. It was full of massive chicks and their exhausted parents flying backwards and forwards with food for them. Boy do those babies make a racket! With hindsight perhaps the small boy in Plockton wasn’t such a public nuisance after all. In the van we had everything we could possibly need to feed us for at least three days but that didn’t stop us going into the café and paying inflated prices for a sandwich and a cup of tea. So the cheap outing wasn’t so cheap after all. Ditto the poem above. Finally we drove further up the coast and rolled into the campsite at Gruinard Bay. This was a mistake for at least three reasons. First of all we paid £20 for the privilege of parking in a tight space between two other outfits. Second, the people too close for comfort on our right had a party that night and kept us awake until the early hours and thirdly there was an all pervading stink of dead seaweed from the beach that was less than two yards from our motorhome. Next morning we drove less than a mile to find a large car park with motorhomes in it next to a perfectly clean white sand bay. There is an ongoing discussion amongst motorhomers about whether it is ethically right to park up for free and not use the campsites in any given area. Some people say that, having paid a lot of money for a motorhome that is virtually self sufficient, why would you then pay other people for services you don’t really need? Others say that we should help the local economy in any place we visit and not be cheapskate freeloaders. We haven’t solved this dilemma yet. A good campsite is worth the relatively small amount of money that it costs to use it. We can do our washing, plug into the mains and charge up all our electrical stuff and meet other campers – but then again, if the site is poorly managed, noisy, dirty or otherwise unpleasant I would rather park up somewhere out of the way and spend a quiet night on our own. In the end, we tend to do a mixture of both things and try to use local shops to boost the local economy. Scotland is dependent on tourism and we’re keen to see it flourish. This trip is showing us just how popular a destination it is and we’re pleased to see the number of motorhomes making their way around the North Coast 500. Watch this space for the next instalment where wild brown trout are helpless when Shirley the fisher is around and we meet a Yorkshire man running a site in the back of beyond. Did you miss out on Applecross?? Shame if you did – the Inn is run by a feisty Yorkshirewoman, native like me of Huddersfield. Her sister runs a cafe in nearby Lochcarron! Lovely photos girls, you really seem to have struck lucky with the weather. Oh and by the way happy anniversary, all be it a day late! Mags, there is another road to Applecross – don’t have to go up the fearsome hill, there is a way from the north – we went in that way and out via the hill. I refused to let my sister have breakfast before we left in case she was sick! Coming down is fine if you are careful… We met an 80+ man with wife in a new Autosleeper half way down, all he was complaining about was the van and all the probs they had had since they got it. Glad you are having such a great time, and the pics are very good! PS I wished I’d known you did music at Hudds – we might know people in common!